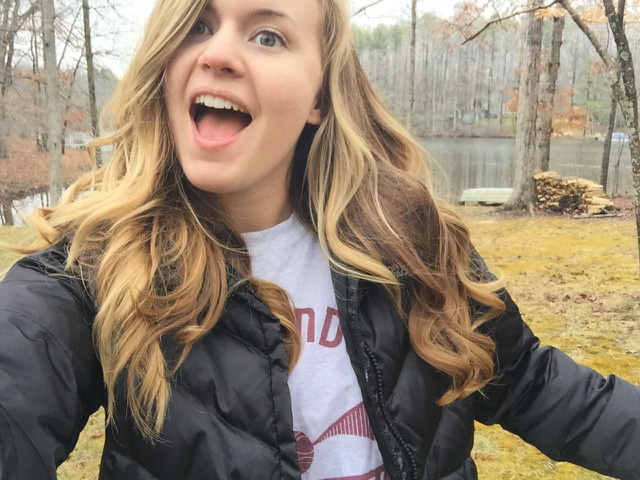 RICHMOND, Va.(4/15/15) –Syndal Haun, 20 is a 5’6 hazel eyed, blonde and brown haired, Virginia Commonwealth University (VCU) college sorority girl, but you would never guess she has a web series called Girls Aren’t Funny on Youtube, along with her best friend Caroline Phipps. The whole interview she was relaxed and answered the questions with ease. She is a positive person and is especially strong since she went back to school after her brain injury that happened in September after two severe concussions while part of the VCU club soccer games. Caroline Phipps, 21, one of her best friends is also a member of her sorority and a public relation major at VCU. She also is the co star of Girls Aren’t Funny too. Syndal met Caroline during the fall of 2012 during their freshman year at VCU. They met sometime during their new New Member process in Sigma and joined at the same time. Caroline said in an email interview. “I remember the first time I really wanted to be her friend was at a party, on her birthday (which is in Sept). We talked in the bathroom about how we were nervous and didn’t know many people. She also did the dance move ‘the worm’ that night and I knew she had to be my best friend.” She works with Syndal and it’s great because, “she is open to any weird and crazy ideas. We have compatible personalities and are respectful of each other. We’ve only had a few creative differences so far.” They worked on a series together because they have a love of comedy and Saturday Night live. Read a lot. Reading inspirational stories and positive readings. I enjoy helping people out of bad funks. Dog named Bella who is a black lab. Adopted a lab and pointer mix named Mosby who is only 7 months old. Morning time. I like to get up early, get coffee then go to the gym. Kevin and I went to Sunday Park to reconcile, and I saw two shooting stars in a span of ten minutes. I’ve never seen one it was cool. It was a good validation that it was meant to be. To fly duh. I’ve always wanted to fly. People should strive more to obtain internal happiness. I have had a Youtube channel for a while, but I just didn’t really do anything with it except put up animal videos or the occasional author one. I recently learned about Booktube which is a community on Youtube about reading books. I’ve been watching videos for a while now, and I want to make my channel all about my ebooks, writing, and reviewing fiction and non-fiction ebooks and books. I’ll even throw in a series that’ll let me rant about retail too while I’m at it. My last exam is May 6th. After that besides writing I’ll have time to focus on the things I want to do. It’ll help me get over my fear of putting myself out there, and I’ll be more comfortable in front of a camera. I can film a video about my writing process and the fiction and non fiction books I can read over and over again. I can film videos talking about my ebooks and even reading them out loud so they can get a taste of my work. I can talk about how they are created too. I can make a series making fun of retail, how stupid it can be at times, and the things I hate that customers do. It’s not all bad but I feel like a lot of people can relate to it. I will be blogging more during the summer even doing story updates. I even have the option to film a typical writing day. There are tons of possibilities with my channel and I can’t wait to begin filming more videos to make this channel as successful as I can. I’m still waiting on a reader, but at this point I might have to go ahead and rewrite The Killer Contract Agency again. I’ve even made a back story for Carter who is the head of it after he defeats Adam. All I have is four more scenes to write then I’ll have a rough draft done of Being an Empathic Witch in Retail Spells Trouble.